At Davis Dodge, our selection of Ram 3500 is sure to get you excited! Ram trucks have the highest customer loyalty of any full-size pickup because our customers demand the best. The 2016 Ram 3500 is part of Canada's most durable heavy duty diesel pickups and offers Best-in-Class towing up to 31,210 lb (14,157 kg), Gross Combined Weight Rating (GCWR) up to 39,100 lb (17,736 kg) and payload up to 7,390 lb (3,352 kg). You'll also enjoy Best-in-Class 900 lb-ft of torque with the 6.7L Cummins® Turbo Diesel I-6 and AISIN® automatic transmission. Combine that with all the premium luxury, advanced technology and innovative safety features offered, and you have a heavy duty truck that will rise to exceed every challenge. Talk with one of our representatives today, and learn why vehicle buyers come from Calgary, Lethbridge and Claresholm for a shopping experience at Davis Dodge. You'll never mistake a Ram truck for any other because, quite simply, there's nothing else like it. The aggressive, forward-leaning grilles come in a variety of finishes, while the aerodynamic lines are as functional as they are bold. 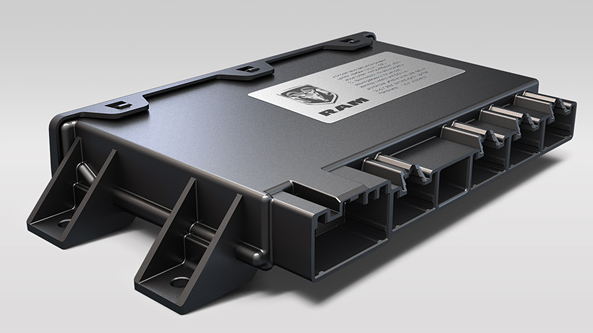 You'll also find storage innovations like the RamBox® Cargo Management System that no other truck offers. This is why Ram has the highest customer loyalty of any full-size pickup. 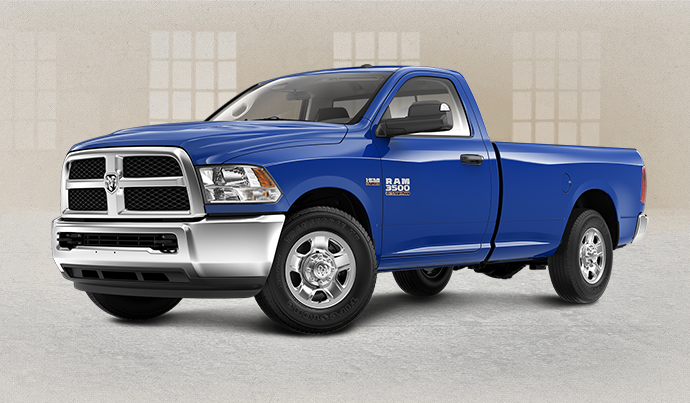 The Ram 3500 is like an office on wheels, especially the Mega Cab® – the most spacious heavy duty truck in its class. Truck owners spend a lot of time inside and that's why it offers seats with durable vinyl or premium leather, along with options like heated and ventilated front seats, and heated rear seats. Class-Exclusive in-floor storage (Crew Cab) – Insulated, waterproof, removable and completely hidden. Door storage – Multi-purpose design with pockets and bins for on-the-go storage. Dual-level glove box – Stay organized with large upper and lower storage areas. Behind-the-seat storage – Standard on Regular Cab and Mega Cab® for added versatility. The Ram 3500 interior is built to work hard and play hard. You can opt for work-grade vinyl seats to withstand the daily grind, or surround yourself with available luxuries like premium leather-faced seats and real-wood accents for a truly refined cabin. For one of the most luxurious trucks on the market, step up to the redesigned Laramie Limited. This flagship model has an all-black interior with luxury trim and Argento wood accents, premium black leather seats, premium leather-wrapped steering wheel with real wood, Keyless Enter 'n GoTM with push-button start and much more. With large and easy-to-use controls, this available feature allows both driver and passenger to set their own temperature. The system will automatically maintain each side individually for absolute comfort. Controls can be adjusted either manually or via the available 8.4-inch touchscreen. Take on those cold mornings with the comfort and luxury of warm hands. This useful feature comes standard on all models with leather-faced seating. Laramie, Laramie Longhorn and Laramie Limited come standard with clear, crisp LED illumination for consistent lighting throughout the cabin. Blue Sapphire backlighting highlights the switches and control locations, and helps you find what you're looking for in the door pockets. Versatility is king in a truck. The newly designed centre console fits everything from tools to a small laptop, and features integrated cup holders and a phone/tablet holder. A media hub with USB port and auxiliary input jack quickly connects your personal devices. Bucket seat models get a full-length floor console with upper and lower clamshell storage, side pockets, and two 12-volt power outlets. A 115-volt power outlet is conveniently located on the centre stack on models with the premium 40/20/40 front bench seat or bucket seats. The big-rig styling is both stylish and functional. The forward-leaning grilles are available with chrome on most models, while the exterior lines are shaped aerodynamically for improved fuel economy and reduced wind noise. The available Segment-Exclusive RamBox® Cargo Management System provides waterproof, illuminated and remotely lockable storage. It's perfect for power tools, cords and all the other things that would normally clutter up the rear seat. It also includes a cargo bed rail system with adjustable cleats to tie down large items. 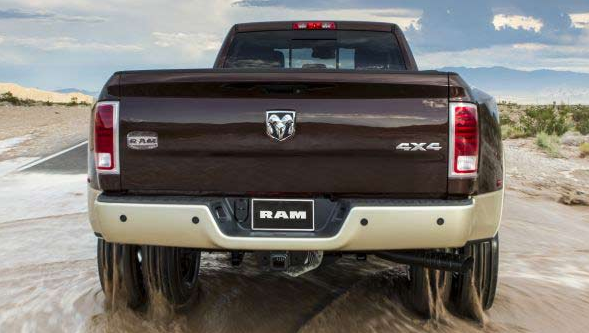 Underpinning the Ram 3500 is a high-strength, 50,000 PSI steel frame. It is constructed with 8 separate cross-members for impressive strength and mass efficiency. It also includes an available factory-installed rear structural cross-member with provisions for 5th Wheel and Gooseneck hitches. The engine, transmission and body mounts, including pioneering hydro-mounts at C-pillar positions, also deliver outstanding control over noise, vibration and harshness, resulting in a superbly quiet interior. lift-assist to make closing the gate easier. The tubular wheel-to-wheel side steps look great, make access easier, and are aerodynamically shaped to reduce drag for improved fuel efficiency. In addition to Single Rear Wheel (SRW), the Ram 3500 offers available Dual Rear Wheel (DRW) models. Each one features fenders that integrate into the box stamping for a sleek, aerodynamic appearance. High-performance quad halogen headlamps come standard on all models. Bifunctional projector headlamps with supplemental high beams and 15-element LED taillamps are available. New for 2016, LED lights are available to illuminate the cargo box. They are bright, crisp and provide reliable lighting for work and play. This is why Ram has the most loyal customers of any full-size pickup brand. 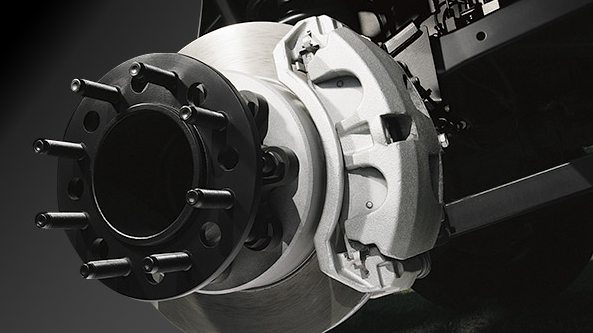 Standard on every Ram 3500 are 4-wheel anti-lock disc brakes with Brake Assist – the largest in its class. The massive rotors and calipers provide dependable stopping power to handle its Best-in-Class towing and payload capabilities. This standard feature provides added traction by allowing the rear wheels to spin independently of each other. When one wheel slips like when accelerating in slippery conditions, the system sends power to the wheel with more grip to improve traction and handling. The available heavy-duty Snowplow Prep Group comes with transfer case skid plates for added protection and upgraded alternators for dependable electrical power in extreme conditions. The front Gross Axle Weight Rating (GAWR) reaches up to 6,000 lb (2,722 kg). 6-speed automatic transmission. 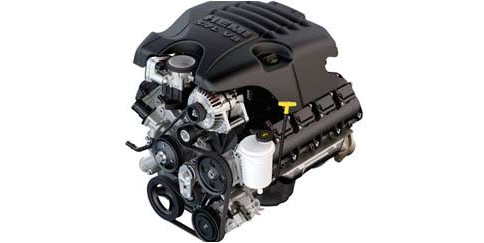 It also features cast-aluminum cylinder heads and a deep-skirt cast-iron block for long-term durability. Specifically engineered to meet the massive demands made of Ram Heavy Duty pickups, this transmission features sophisticated multi-range electronic control and optimized gear ratios. 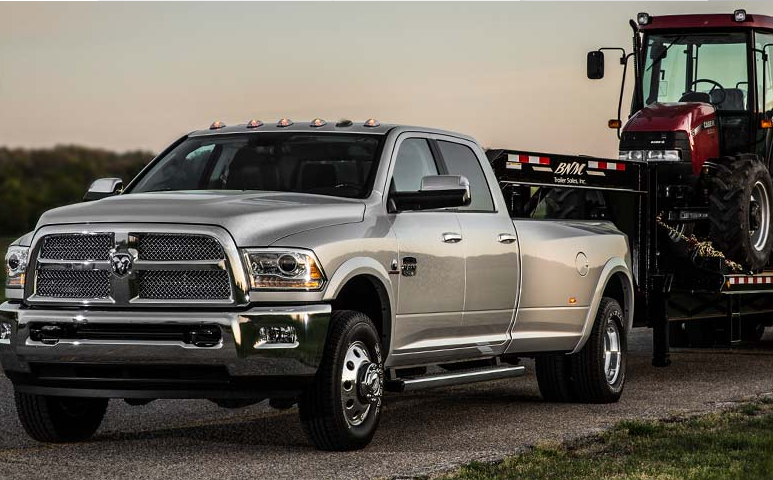 The Ram 3500 dominates with a Best-in-Class towing capacity of up to 31,210 lb (14,157 kg). A Class V receiver hitch with 18,000 lb (8,164 kg) capacity, 4- and 7-pin trailer tow wiring connectors, and Electronic Stability Control with Trailer Sway Control come standard. Hauling loads is just as important to heavy duty owners so get the best. 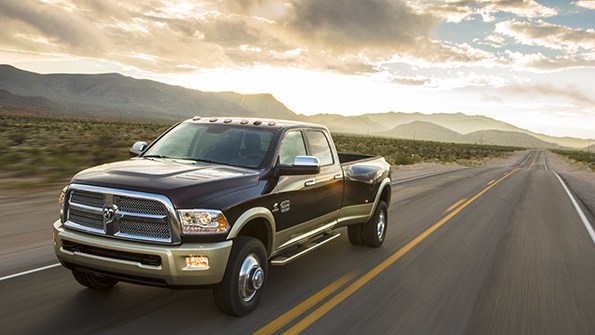 The Ram 3500 also dominates with Best-in-Class payload of up to 7,390 lb (3,352 kg). The available factory-installed rear axle structural cross-member gives you heavy-load capability and is ready for 5th-Wheel or Gooseneck hitches from Mopar®. It's integrated into the box floor and the hitch (not included) can be removed for flat-floor cargo capability. Included with the 5th-Wheel/Gooseneck Prep Package is a factory-installed cargo bed-mounted 4- and 7-pin trailer wiring harness for easy connections. 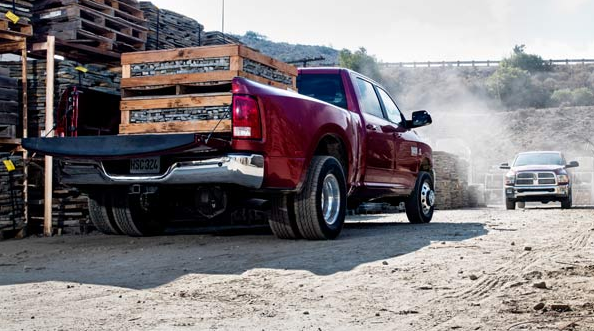 Every Ram 3500 comes standard with a rear suspension featuring high-strength longitudinal leaf springs and solid rear axle. The design allows for precise handling, reduced body roll and exceptional payload capability. Standard on all models, its wide frame, outward positioned springs and large frame-to-axle radius delivers a smooth ride and confident handling. It helps achieve a Gross Vehicle Weight Rating up to 14,000 lb (6,350 kg) and Best-in-Class Gross Combined Weight Rating up to 39,100 lb (17,736 kg)3. All DRW models include separate auxiliary leaves as part of the spring package. The leaf springs have higher 2nd- and 3rd-stage rates for enhanced rear handling and Best-in-Class payload capability of up to 7,390 lb (3,352 kg). Get the latest in advanced technology to make your life easier. The Class-Leading 7-inch customizable full-colour in-cluster display keeps you informed of vital vehicle data, while available Uconnect® 8.4 multimedia centre arms you with the largest touchscreen in its class. Then there's also the convenience and safety of standard hands-free communication with Bluetooth® streaming audio. Staying connected in the Ram 3500 is as impressive as its capability. Stay connected and charge your personal devices with an auxiliary audio input jack and USB port. 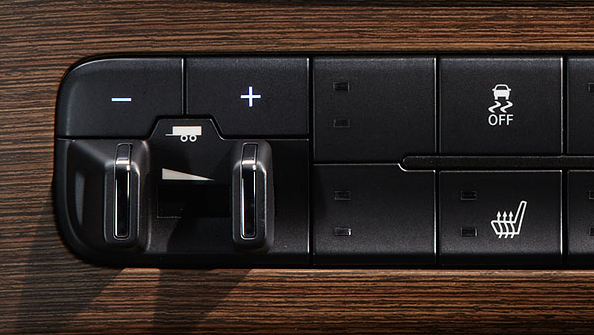 An SD card slot is included with the available Uconnect® 8.4 or 8.4 NAV multimedia centre. The multimedia hub is conveniently located in the armrest storage bin or in the centre fold-down bin. This feature continually measures the flow of current into and out of the battery, enabling intelligent load shedding. If the battery starts to run low, it systematically shuts off electrical systems onboard the vehicle to prevent depleting the battery. 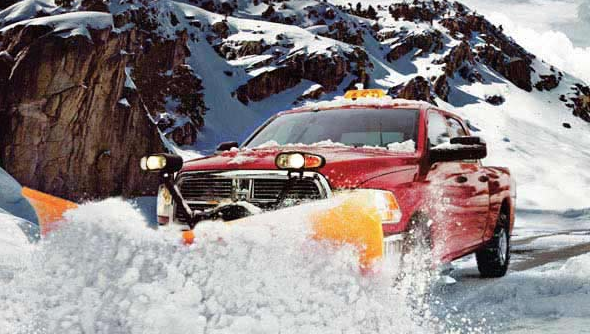 This available feature comes with a host of inputs and outputs for simple and secure connection to any number of external features like snowplows and tow lights to the truck’s electrical system. This available feature improves braking stability by allowing you to modulate the trailer's braking system in relation to the vehicle. It is factory installed and integrated into the centre stack. A display in the instrument cluster informs you when it is in operation. All the vehicle information you need sits front and centre, and you can customize how it's all displayed with this Class-Exclusive feature. 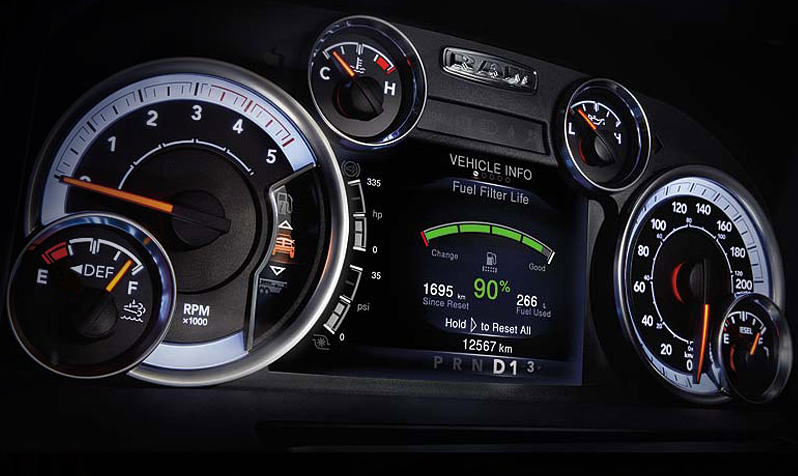 The full-colour interface provides access to a wide range of information, including engine performance numbers, critical pressures, powertrain temperatures and more. 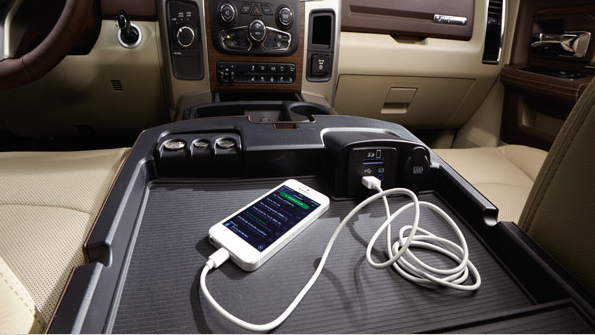 The available Uconnect® multimedia centres offer innovative technology like hands-free communication with Bluetooth® streaming audio for intuitive control of your entertainment, vehicle systems and more. Uconnect 8.4 multimedia centre comes with a largest-in-class 8.4-inch touchscreen, while Uconnect 8.4 NAV multimedia centre adds premium navigation. This standard feature allows you to control your music, smartphone and available navigation with simple voice commands. Not only is this convenient, it's also safer by allowing you to keep your hands on the wheel. Park-Sense® Front and Rear Park Assist uses ultrasonic sensors to scan for objects in front and behind the vehicle. It provides a visual warning and audible chime that increases in intensity as you get closer to an obstacle. It is available on ST and SLT, and standard on Laramie, Laramie Longhorn and Laramie Limited. The ParkView® Rear Back-Up Camera displays on the touchscreen a high-resolution image of what's behind you whenever Reverse is engaged. It also uses grid lines to help steer you into tight spots, and makes trailer hookups easier. The available Centre High-Mounted Stop Lamp (CHMSL) Camera makes 5th-Wheel/Gooseneck hookups simple and lets you keep an eye on your cargo. The image is clearly displayed on the touchscreen. If packaged with the ParkView® Rear Back-Up Camera, new functionality has been added for 2016 so you can now toggle between both views on the touchscreen.